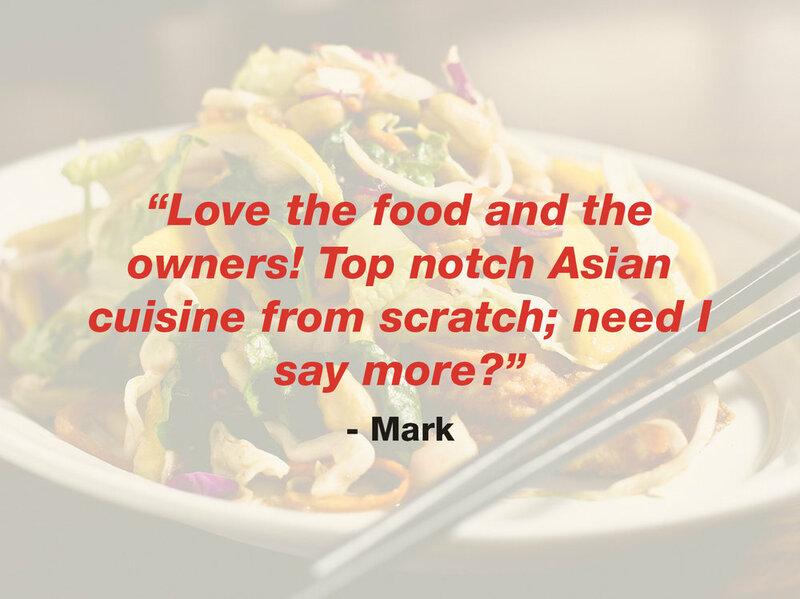 ENJOY OUR ASIAN INSPIRED DINING! 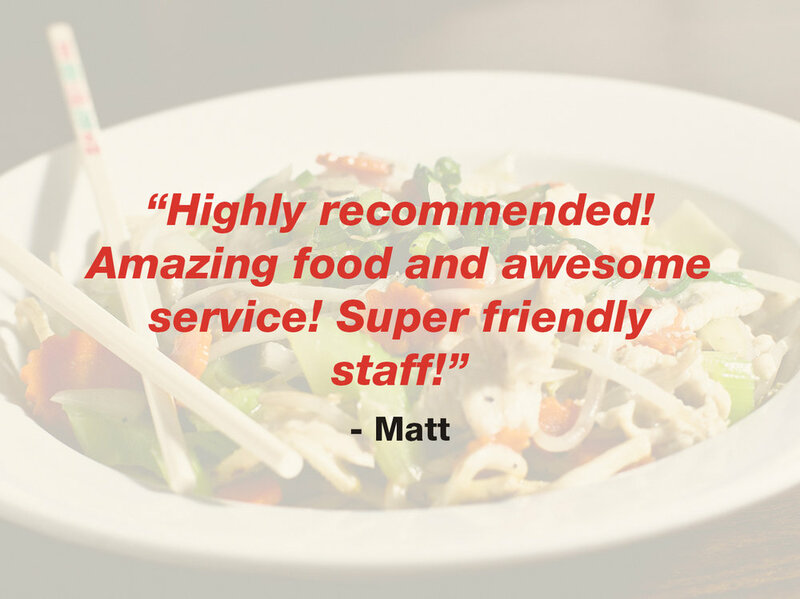 Chan Bistro is an Asian Inspired restaurant that services Spokane Valley, WA with oriental style fine dining and takeout. Located at 1409 N Argonne, Chan Bistro is owned and operated by Julie Schroeder & Juana Garcia. Julie and Juana have been friends for over a decade, and they both have worked in the hospitality industry for over 29 years. The dream of starting their own business began with wanting to work in an atmosphere where respect and appreciation came first. The result? A down-to-earth, contemporary eatery that prides itself in preparing the best Chinese, Japanese, Thai & Vietnamese specialties in town. We use only quality ingredients, with all menu items made fresh in house. Choice of chicken or tofu. Each served with one spring roll and fried rice. Coconut milk, sliced chicken, onions, fresh lemongrass, galanga, lemon juice, chili paste and mushrooms. Topped with cilantro. Sliced chicken, onions, fresh lemongrass, galanga, lemon juice, chili paste and mushrooms. Topped with cilantro. House made chicken dumplings, sliced chicken, baby bok choy and rice noodles. Topped with cilantro and white and green onions. Ground chicken, shredded cabbage and rice noodles. Topped with ground peanuts, white and green onions and cilantro. Tender beef, meatballs, rice noodles and shredded cabbage. Garnished with green and white onions and cilantro. Glass noodles mixed with romaine, green and red cabbage, onions, peanuts, carrots and ground chicken. Tossed in our house made ginger dressing. Grilled chicken tossed with mixed greens. Topped with toasted rice noodles. Choice of chili lime or ginger miso dressing. Lightly fried, boneless 8 oz fillet of trout topped with red and green cabbage, romaine, chopped green apples, mangoes, carrots and peanuts. Tossed in our house made ginger dressing. All noodles served with choice of chicken, pork or tofu. Beef is $2.00 extra. Prawns are $2.00 extra. Seafood combo is $4.00 extra. Sautéed carrots, zucchini, green and white onions, mushrooms, and celery in a clear garlic sauce. Served over pan fried Udon noodles. Sautéed with cabbage, carrots, zucchini, and broccoli in a garlic soy sauce. Topped with sesame seeds. Rice noodles stir fried with ground peanuts, shredded cabbage, bean sprouts and egg in a fresh tamarind sauce. Topped with ground peanuts and garnished with shredded carrots and cabbage. Sautéed with cabbage, carrots, zucchini, mushrooms, white and green onions, bell pepper and egg in a garlic soy sauce. Carrots, broccoli, white onions and bell pepper. Sautéed in a sweet soy sauce. Sautéed with broccoli, white and green onions, carrots, mushrooms, cabbage and zucchini. Topped with sesame seeds. All house specials served with choice of chicken, pork or tofu. Beef is $2.00 extra. Prawns are $2.00 extra. Seafood combo is $4.00 extra. Tempura style with white onions, chili peppers, and topped with green onions. Stir fried with green and white onions, carrots, celery, bell pepper, green beans and cashews. Cabbage, carrots, broccoli, white onion, mushrooms and zucchini in a garlic oyster sauce. Tempura style served on a bed of steamed cabbage, carrots and pineapple. Garnished with steamed broccoli. Topped with sesame seeds. White onions, mushrooms, bell pepper, green beans and fresh basil. Sautéed in a light garlic sauce. Bell pepper, white onions, carrots and cabbage. Simmered in a curry sauce. Stir fried with mushrooms, onions, carrots, zucchini, peanuts and toasted chili peppers in a hoison garlic sauce. Sliced tempura style chicken with our home made gravy. Served over shredded romaine and topped with crushed almonds. Crispy chicken stir fried in a freshly zested orange sauce. Served over steamed cabbage, carrots, zucchini and pineapple. Garnished with steamed broccoli. Topped with sesame seeds. Crispy chicken stir fried in Chan’s teriyaki sauce. Served over steamed jasmine rice. Garnished with steamed broccoli. Topped with green onions and sesame seeds. Freshly steamed carrots, cabbage, broccoli, zucchini, mushrooms and onions, with choice of chicken or tofu. Topped with our house made peanut sauce. Stir fried pork or chicken in a garlic oyster sauce. Served over steamed cabbage, carrots and zucchini. Garnished with steamed broccoli. Topped with cilantro and toasted garlic. Sliced tempura style chicken with our home made zested lemon sauce. Served over shredded romaine and topped with sesame seeds. White onions, carrots, peas and egg. Stir fried in a garlic sauce. Topped with green onions. Crispy beef on a bed of fresh steamed cabbage and carrots. Garnished with steamed broccoli. Topped with green onions and sesame seeds. Crispy beef stir fried in freshly zested orange sauce. Served over steamed carrots, cabbage, zucchini and pineapple. Garnished with steamed broccoli. Topped with sesame seeds. Crispy beef stir fried in Chan’s teriyaki sauce. Served over steamed jasmine rice. Garnished with steamed broccoli, topped with green onions and sesame seeds. Broccoli, carrots, white onions and mushrooms. Sautéed in a black bean sauce. Stir fried with bell peppers, white onions and carrots. Sautéed in a black bean sauce. Stir fried with bok choy, mushrooms, white onions, zucchini, and bell pepper in a garlic oyster sauce. Stir fried prawns in a tangy sesame mustard sauce. Served over shredded romaine and garnished with steamed broccoli. Topped with sesame seeds. Eight-ounce wild salmon topped with ginger sauce and scallions. Served with sautéed vegetables and rice. Wild Salmon, scallops and prawns stir fried with celery, mushrooms, zucchini, carrots, bell pepper, white and green onions in a clear garlic sauce. Stir fried prawns in a garlic soy sauce, served with shredded romaine and garnished with steamed broccoli. Topped with fresh cilantro and toasted garlic.